They know when to stop. At The Huffington Post, since the news never stops, and there is the temptation for editors, reporters, and engineers to try to match the twenty- four-hour news cycle, we do a lot to prevent burnout. First, we make it very clear that no one is expected to check work email and respond after hours or over the weekend (unless, of course, these are their working hours). Everyone has at least three weeks of vacation time, which they are highly encouraged to take. And I have implored HuffPosters — without much success, I must admit — to eat lunch away from their desks. We also have two nap rooms in our newsroom, which are now full most of the time, even though they were met with skepticism and reluctance when we installed them in the spring of 2011. Many were afraid their colleagues might think they were shirking their duties by taking a nap. We’ve made it very clear, however, that walking around drained and exhausted is what should be looked down on — not taking a break to rest and recharge. In our New York offices we host meditation, breathing, and yoga classes throughout the week, while our new D.C. offices have dedicated meditation, yoga, and nap rooms. And the benefits of standing and walking as opposed to sitting all day long, which I describe later in the chapter, led us to provide a standing desk to anyone who requests it. We also have a gym and take part in the Virgin Pulse wellness program, where employees can earn up to $500 a year by engaging in healthy practices. And to facilitate such healthy practices, we have refrigerators stocked with healthy snacks, including yogurt, hummus, fruit, and baby carrots — although I’ve noticed that the bulk of the baby carrots remain unclaimed and look rather forlorn by the end of the week. This is not just good for those who work at HuffPost; it’s good for HuffPost. At Facebook, COO Sheryl Sandberg has said publicly that she leaves the office at 5:30 to have dinner with her two young children and she encourages others to find schedules that work for them so they can get the time with their families — or just the time for themselves — that they need. The relationship between overwork and a loss of productivity is consistent regardless of nationality or culture. According to 2012 numbers from the Organization for Economic Cooperation and Development (OECD), among European countries, Greece was number one in hours worked, Hungary was second, and Poland third. Their productivity rankings, however, were eighteenth, twenty- fourth, and twenty- fi fth (dead last). Working the fewest hours were the Dutch, Germans, and Norwegians, who came in at fifth, seventh, and second in productivity. Increasingly, companies are realizing that their employees’ health is one of the most important predictors of the company’s health, as well. In those all- important Wall Street conference calls, business analysts, in addition to asking about sales reports, market share, and earnings, should be quizzing CEOs about their employees’ stress levels. But the trend goes far beyond Silicon Valley. Janice Marturano set up a popular mindfulness program at General Mills when she served as its deputy general counsel, with a meditation room in every building of the campus. She has since founded the Institute for Mindful Leadership. “Mindfulness is about training our minds to be more focused, to see with clarity, to have spaciousness for creativity and to feel connected,” she says. “That compassion to ourselves, to everyone around us — our colleagues, customers — that’s what the training of mindfulness is really about. . . . There is no work- life balance. We have one life. What’s most important is that you be awake for it.” And it works. Eighty percent of senior executives from General Mills and a dozen other Fortune 500 companies who participated in her mindfulness leadership trainings said they felt the mindfulness program had improved their ability to make better decisions. One of the primary obstacles keeping many businesses from adopting more sane and sustainable metrics of success is the stubborn — and dangerously wrongheaded — myth that there is a trade- off between high performance at work and taking care of ourselves. This couldn’t be less true. In 2013, among Fortune’s “100 Best Companies to Work For,” several stood out for their commitment to well- being. Salesforce.com, which offers free yoga, a $100 benefit for wellness, and forty- eight hours of paid time to volunteer, came in at number nineteen. At number four was the Boston Consulting Group, which flags employees working too many long weeks with a “red zone report” and allows new hires to delay starting for six months and receive $10,000 when they volunteer to work for a nonprofit. At the nearly one- hundred- year- old supermarket chain Wegmans, Danny Wegman, grandson of the founder, has recognized the benefit of encouraging his forty- five thousand employees to get healthier. The company now offers on- site yoga and Zumba classes, nutritional counseling, and high blood pressure screenings. At Aetna, the third-largest health insurance provider in the United States, CEO Mark Bertolini discovered the health benefits of meditation, yoga, and acupuncture while recovering from a horrible ski accident that left him with a broken neck. He proceeded to make them available to his forty- nine thousand employees and brought in Duke University to conduct a study on the cost savings. The results? A 7 percent drop in health care costs in 2012 and sixty- nine minutes of additional productivity per day for those employees who participated in Aetna’s wellness programs. And doing yoga one hour each week reduced stress among employees by one- third. Ray Dalio, the founder of Bridgewater, one of the largest hedge funds in the world, who has been meditating for more than thirty- five years and considers it “the single most important reason” for his success, pays for half of his employees’ meditation classes and picks up the entire bill if they commit to it for more than six months. John Mackey, the CEO of Whole Foods, summed up his vision of compassionate management at HuffPost’s first Third Metric conference in the summer of 2013: “We must bring love out of the corporate closet.” And Third Metric wellness practices extend far beyond yoga and meditation. Farhad Chowdhury, CEO of the software development company Fifth Tribe, connects with colleagues during four- mile hikes. As Gregory Berns, author of Iconoclast: A Neuroscientist Reveals How to Think Differently, writes, insight and discovery are most accessible to us when we break up our routine. “Only when the brain is confronted with stimuli that it has not encountered before does it start to reorganize perception. The surest way to provoke the imagination, then, is to seek out environments you have no experience with.” Nobel Prize– winning chemist Kary Mullis, he notes, landed on the principle of polymerase chain reaction, or PCR, not in a lab but on a Northern California highway. What matters is that we find a way — any way — to recharge and renew ourselves. 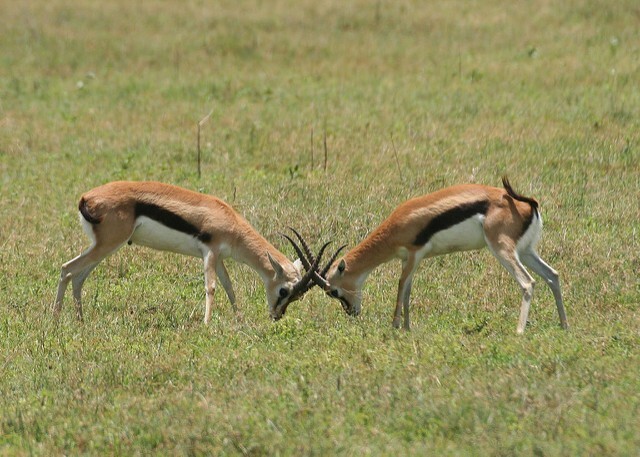 My screensaver is a picture of gazelles: They are my role models. They run and flee when there is a danger — a leopard or a lion approaching — but as soon as the danger passes, they stop and go back to grazing peacefully without a care in the world. But human beings cannot distinguish between real dangers and imagined ones. As Mark Williams explains, “The brain’s alarm signals start to be triggered not only by the current scare, but by past threats and future worries. . . . So when we humans bring to mind other threats and losses, as well as the current scenario, our bodies’ fight- or- flight systems do not switch off when the danger is past. Unlike the gazelles, we don’t stop running.” This is modern man’s predicament, perfectly summed up by Montaigne: “There were many terrible things in my life, but most of them never happened.” We need to liberate ourselves from the tyranny of our fight- or- flight mechanism. And yet much of our life has actually been structured so that we live in an almost permanent state of fight- or- flight — here comes another dozen emails calling out for a response; must stay up late to finish the project; I’ll just use these four minutes of downtime to return six more calls. Under our current definition of success, a chronic state of fight-or-flight is a feature, not a bug.